Graffiti Spirits, widely regarded in Liverpool as prime innovators behind Liverpool's progressive new cocktail and independent eating out scene launched new cocktail bar & Brazilian Rodizio - Santa Maluco last night. Director Matthew Farrell, one of the partners behind the fiercely independent group who already operate city centre bars Santa Chupitos, El Bandito, Salt Dog Slims, 81 Ltd and their 'smokehouse and cocktails' venue Slim's Pork Chop Express witnessed guests enjoying signature cocktails and a touch of Brazilian Rodizio with their Neapolitan pizza. 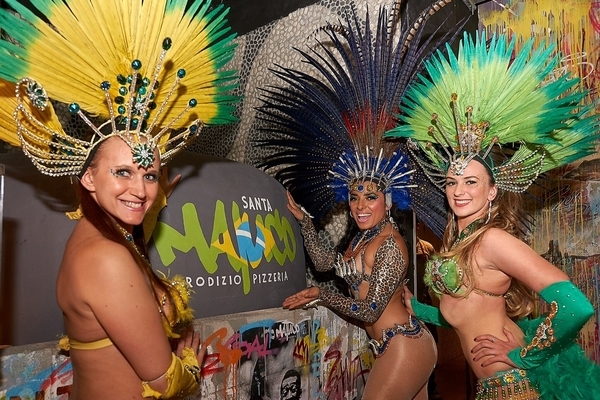 Rodizio refers to the social way in which food is served...waiters roamed the floor last night with complimentary pieces of pizzas that guests can now buy by the slice. “The pizzas are 100% twenty inch Southern Italian, thin crust wood-fired beauties" Matt added. One guest summed up the evening nicely.